You know a cookbook is good when you have to tell yourself to stop cooking from it and move on to another project. But before I do, let me tell you about the entire meal I made from this book and and the friends I served it to. What can I say about Mo? That she walks in beauty like the night? Yes, she does, and during the day too. That she has been my friend for a shocking 26 years and we were adults when we met? Also true. That she is an amazing artist, that she should teach a graduate course on parenting, and that she makes everything she touches more fun? All true. And most important to all of you she came up with the ingenious title of this blog! Colin is Mo’s extraordinary spouse. He takes beautiful photographs, runs marathons, I think, every day after work, does all the homework for our book group (including spreadsheets and Skype calls with authors), actually spoke to Sandra Bullock in an airport AND got me hooked on Project Runway. They don’t make humans much more interesting than that! Mo and Colin came over to eat “Cheez-it-ish Crackers,” “My Go-To Beef Daube,” the mashed potatoes from “Hachis Parmentier” (with the Gruyere mixed into the potatoes vs. sprinkled on top), and “Long and Slow Apples.” They’re troopers they are. In order of appearance: the crackers are divine and easy. Flour, butter, cheese (Gruyere in this case), salt, pepper, and a pinch of cayenne. All joined in holy matrimony in the food processor and then (one option) rolled into logs, chilled, sliced, and baked. They can be made way ahead and chilled or frozen. Not quite Cheez-its but you won’t care. They’re better. 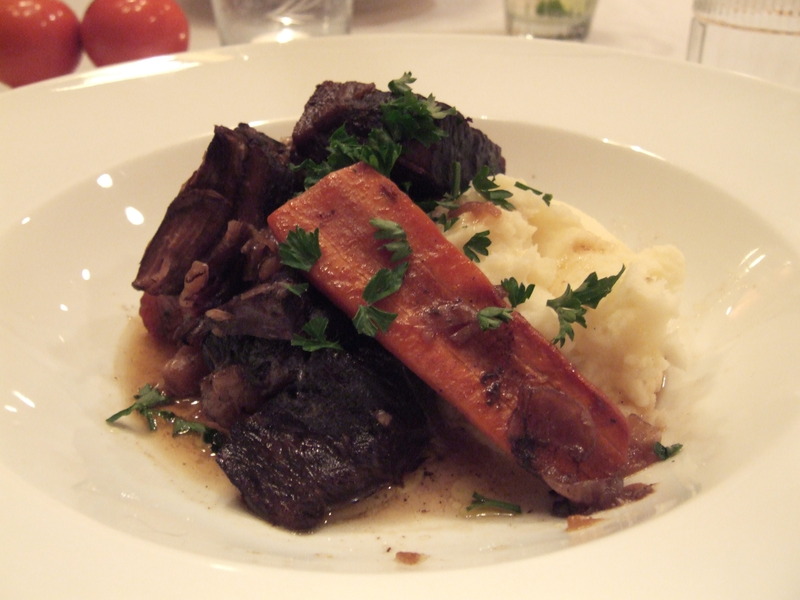 The Daube is also easy. Chuck roast, carrots, parsnips, bacon, onions and shallots, red wine (funnily enough, I thought I’d made a mistake when I got home and discovered I had a bottle of Shiraz and not the Syrah Dorie recommends and blamed it on my near-complete ignorance of wine. Thanks to Wikipedia I learned: they’re the same thing. Very funny vintners. ), brandy, and a bouquet garni. Bacon is cooked, meat is browned in bacon drippings, onions are cooked (I like mine caramelized), then it’s everybody into the pool and the whole thing bakes for 2-1/2 hours. I served it over mashed potatoes but you could use anything absorbent underneath. We all loved it. The apples were problematic. You slice apples very thinly (I did this by hand but you can use a food processor or a mandoline) and layer them in individual ramekins with butter and sugar mixed with ground coriander and ginger and orange zest. Dorie then tells you to cover the ramekins in plastic wrap and says that it will not melt. Well, I’m here to tell you: it does melt. Perhaps they have some kind of special non-melting plastic wrap in France but Saran Wrap, as it turns out, is not impervious to heat. I saved the dish by removing the top layer of apples and told myself that eating a little plastic wrap is not as bad as eating a little glass, and all ended well (at least I assume; Mo and Colin, how are you feeling?). I topped it with Dorie’s whipped cream and served with a crispy oatmeal cookie. This looks excellent; I’m glad this book is in my pile so I can keep running over and check out what you’re talking about after you post. There must be some kind of plastic wrap that’s impervious to heat. I don’t know because Walter won’t even let me use it in the microwave to cover whatever I am heating up. And now, after hearing this, I sort of don’t blame him. Let me ask you this – if you were making this meal again, would you make that fantastic-looking apple cake instead? I’m still unpacking after our office move which is now into its eleventh day. Can I come over for dinner? P.S. Sorry about a second comment. We don’t love turkey so often we eat something else on Thanksgiving. 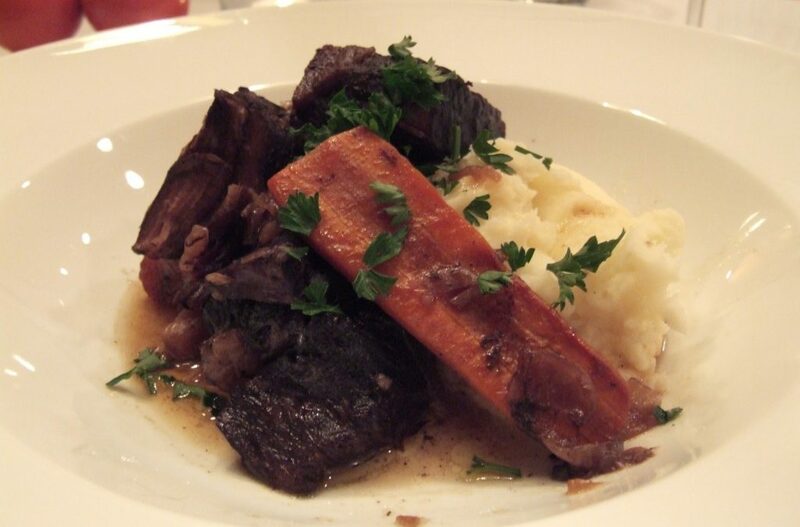 I am thinking that daube would be perfect. Maybe that’s because I’m feeling so punk now what with all the packing, moving (to Wall Street), packing, moving (the rest of the stuff upstate), unpacking, trying to actually do some office work in the middle of it all, and I’m getting a head cold so this looks so comforting to me. This is sure a good post! 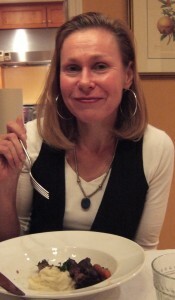 The dinner was AMAZING. I have never tasted such flavorful beef and the carrots were sweet, tender and the perfect texture, served over the most delicious creamy, full bodied potatoes. 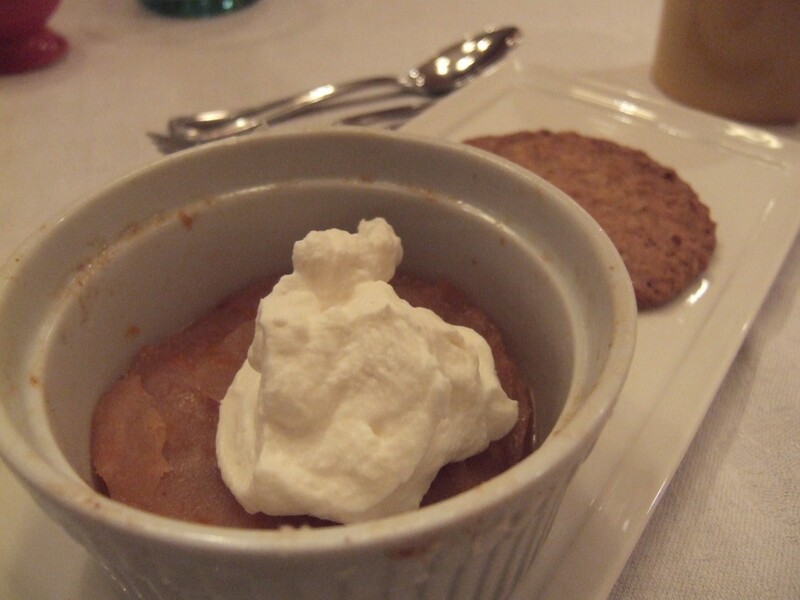 Lovely dessert with the most delicate flavors dancing through the apples. The meal was only surpassed by the company and conversation – everyone should be as lucky as I am to have such a great, talented friend. I’ve been collecting cookbooks for over 50 years and have accumulated about 50 French books. I vowed to never buy another one. But … this one looks sooooooooo interesting. Maybe I’ll ask for it for Christmas, maybe I won’t wait. We’ll see. Kate, I would have loved to have been at your dinner with you, Mo and the very modest Colin : -) I’m glad you’ve been enjoying the cookbook, but of course, I’m disturbed about the apples. The recipe was tested a bunch of times — in fact, it appeared in Bon Appetit and so was tested in the test kitchens there — but still your plastic melted. I’ve got a question and a suggestion. First, did you wrap the ramekins in plastic or just cover the tops? (I wrap mine — I put a sheet of Saran or Reynolds plastic wrap on the counter, then lift up the sides and cover the top of the apples, then do the same thing with the foil, so the plastic is completely covered.) Second, if you’d like to do it again but are ‘melted plastic shy’, try baking them at 200 degrees F for 4 hours. Dorie, we would have loved to have you there! I did just cover the tops of the ramekins with plastic, maybe that was my problem. Now that I read the instructions again (and after reading the above comment) I can see the distinction. Maybe without wrapping the whole ramekin my plastic sagged onto the apples and, thus, melted? I will definitely try again as I think it’s such a nice, simple dessert and a good end to a heavier meal like daube.